You can learn more about the history of Rome during your trip to a top site such as Piazza Navona. Discover the area's fascinating museums and stunning cathedral. Rome City Centre is a welcoming neighbourhood. Part of the neighbourhood’s charm is its architecture. For a taste of local culture, you can visit the historic landmarks and cathedral. An historic neighbourhood, Vatican offers a variety of options for cafes. In addition to its architecture, the neighbourhood has many charming qualities. You can experience the local cathedral and museums, or enjoy the natural beauty of the riverfront. 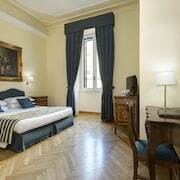 Trastevere is an historic neighbourhood that’s popular for its restaurants and bars. In addition to its architecture, the neighbourhood has many charming qualities. Broaden your horizons with some local cathedral. An historic neighbourhood, Esquilino offers a variety of options for restaurants and cafes. The neighbourhood has many appealing features, among them its architecture. 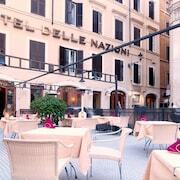 An historic neighbourhood, Navona offers a variety of options for cafes. The neighbourhood’s charm comes through in its architecture. 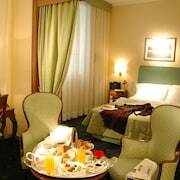 Although we did not let the state of the apartment spoil our enjoyment of the beautiful city of Rome, we were very disappointed with the accommodation. 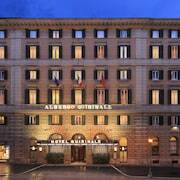 For us the hotel, its location close to the main sights of Rome and the vibrant local area with bars and restaurants within walking distance met our requirements perfectly. 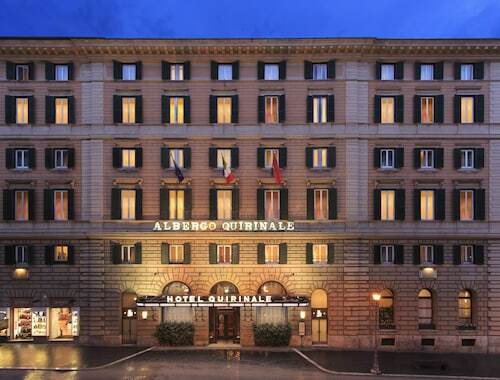 All told we enjoyed our stay at the Quirinale and appreciated its central position in Rome enabling a lot of the main sites to be in easy walking distance. The hotel also comes with an 8th floor roof terrace which has an amazing 360 degree view of Rome itself (well worth the money in itself). Arrived at the hotel at around 10:30pm, was greeted by a helpful member of staff who carried our bags to the room and showed us around and provided a map of Rome and directions to the Metro etc. When booking a trip to Rome, make a list of must-sees and you'll wonder how to fit it all in. The short answer of course is that you can't - what you can do is fill your trip Rome with some of the most iconic historical sites in the world. Rome is like a discourse on Western Civilization with a history that spans the ages, and has countless artefacts to prove it. The Roman Empire was one of the most impressive the world has ever known, with many of its ideals and principles still reflected in modern institutions today. From the Colosseum to the Pantheon, the Sistine Chapel and Palatine Hill, Rome is home to some of the world’s most recognizable landmarks. While the impulse to rush from sight to sight is understandable, don’t sell yourself—or the city—short. Some of the best discoveries you’ll make from your hotel in Rome will be those you happen upon by accident; ducking into an ancient church on a side street housing a masterpiece of sacred art, stumbling upon an expansive piazza in the early morning light, and sampling the best pizza that you’ve ever tasted in your life. 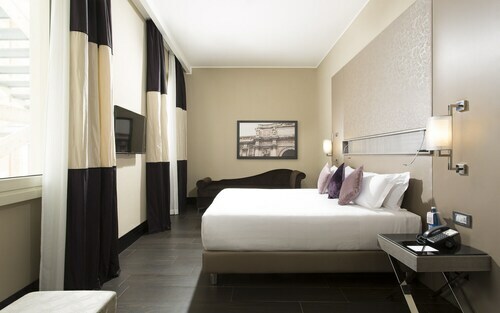 Rome is the Eternal City, so approach it as if you have all the time in the world to explore. There's no need to cram everything into one visit as you'll soon fall under the city's spell, and return again and again. If you're searching for the good life, all roads lead to Rome. 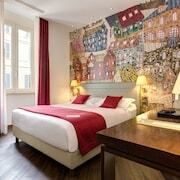 The city is a dizzying combination of cosmopolitan capital and ancient wonderland. The home of Catholicism, it also plays host to nightclubs that stay open until dawn. One of the most iconic images of the city comes from the filmmaker Federico Fellini, one of Rome's most adoring fans. In La Dolce Vita (The Sweet Life), Anita Ekberg frolics in the beautiful Trevi Fountain after a long night's revelry. The scene is spontaneous, carefree and a little crazy, reflecting Rome itself and the visceral impact it has on visitors. Try a romantic cruise down the Tiber River or watch the world go by from a Trastevere café and you too will believe life can't get any sweeter. 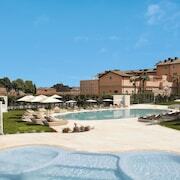 Rome is situated in the middle of Italy, the perfect position for the country’s capital. In some respects, however, it is set apart from the rest of the country and has a personality all of its own. Rome is as much about frenetic traffic as chilling over cappuccino, appreciating art as appreciating gelato on a hot summer day. Hit the museums (the Vatican Museums are extraordinary, as are the Capitoline Museums and a litany of others), but then slow down and stroll through Villa Borghese, a large park well-loved for picnics (and its museum the Borghese Gallery). 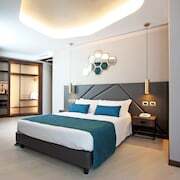 With its culture, art, food, and wine, a Rome hotel offers a holiday like no other, distilling all that can be enjoyed in life. 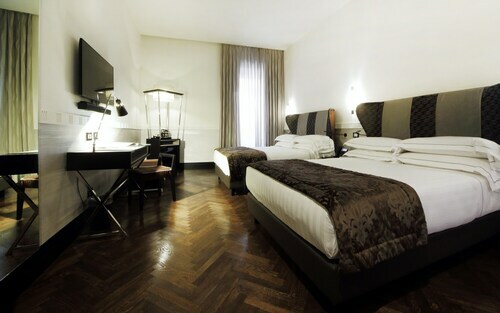 Experience all Rome has to offer by booking a 4 star hotel in Rome for a bit of luxury or opt for a hostel or a cheap hotel in Rome. 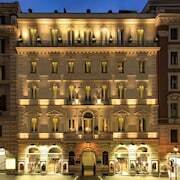 You may be able to save money by booking your Rome flight and hotel together. Summers in Rome bring atmospheric crowds and glorious hot spells, but accommodation prices do spike if you don’t book early. The best months to visit are between October and April, when the crowds have disappeared and room rates drop; temperatures are lower but you’ll still be able to get out and about. For warmer weather visits, choose May or September, just before or after peak season. Explore Rome with Expedia's Travel Guides to find the best flights, cars, holiday packages and more!